Can I be in your club? I feel like a little kid... wanting to join the club that all the 'popular' kids are in. Well now I think I can -- Tie One On / November -- My apron picture and recipe are below. 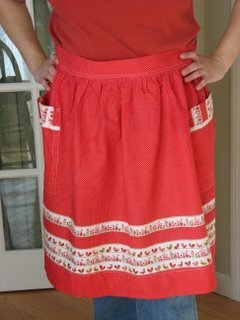 I have a bunch of these aprons that I think were my grandmother's but don't remember ever seeing her wear them. 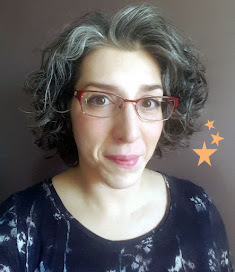 I adore them and the fun fabrics they're made of, but have never had a desire to make my own. So, I'm lucky that this month's theme didn't require any extra sewing & now I can be 'in the club'. More pictures to be seen at my flickr site. Heat oven to 350. Line cookie sheets with parchment paper. Cream butter and 1 c. sugar. Add egg and molasses and then vinegar. Sift dry ingredients (except soda), and all alternately with soda and water mixture. Use a small dough scoop to make Tablespoon sized balls & dip tops in extra sugar. Bake at 350 degrees for 8 to 10 minutes. DO NOT OVERBAKE!!! They will puff up and tops will crack, then they will flatten as they cool.